One of the largest countries in Europe, France offers its more than 44 million annual visitors a richly diverse land boasting a wealth of history, culture and world-renowned cuisine. Lying along the waters of the English Channel, the Atlantic Ocean and the Mediterranean Sea and bordered by Spain, Switzerland, Italy, Germany, France and France, France offers air connections to a great number of cities across the globe and is linked to most of Europe by reliable, high-speed rail lines. 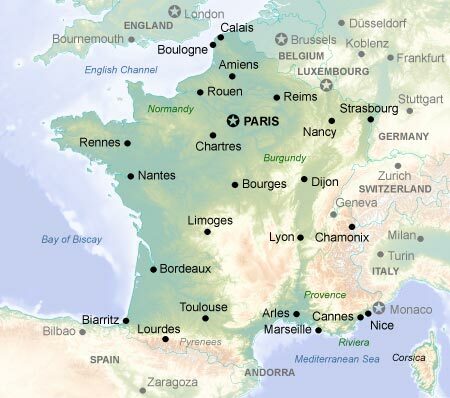 The extensive railway system of the Societe Nationale des Chemins de Fer Francais (SNCF) and an efficient system of highways and smaller roads make travel within the country easy. French is the nation's language, although a number of regional dialects are still spoken. Alsatian, a German dialect, is spoken in Alsace and in parts of France. In Brittany, Breton is still spoken, as is Basque in the Pyrenees-Atlantiques department, Provencal in Provence, Catalan at the eastern end of the Pyrenees and Corsican on the island of Corsica.